I like the idea of cherries but have a hard time feeding them to my family. They’re the best and worst fruit rolled into one. They’re ruby red and crisp, sweet and tangy, but as ornery as a rosebush. I love them and the kids love them and my husband loves them, but the only right time to eat them is smocked from head to toe, outdoors, in the grass, near a water source to hose down afterward. They will happily stain your clothes, your hair, your furniture and skin for days, if not forever. Not to mention the pits. Ugh. The pits. I have nightmares about the kids choking on them. Almost as bad was the day they threw them into the garbage disposal. When I scraped down our dinner leftovers and turned it on, the blade exploded like a thousand shards of glass against a brick wall. Then it stopped. For good. Of course, it was crammed with food, so by the time we got it fixed, our kitchen smelled like Venice in August. I was lamenting the untouched bowl of cherries wilting on my kitchen counter while reading Molly Wizenberg’s site, Orangette. She had just posted a recipe for Strawberry Yogurt Popsicles. They were so cute that I bought her molds online that instant. I looked back at the cherries on the counter. Bingo! Bright red cherry pops were the perfect solution. Now, I’m not much of a gadget person. I don’t own an apple corer or egg slicer or even a garlic press, and I realize I’m already hoping you have popsicle molds (if not you can always use paper cups). 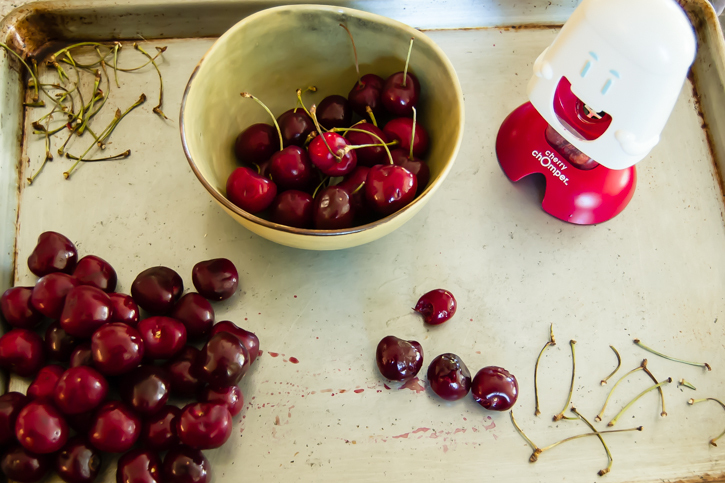 But there is no substitute for a cherry pitter. Try carving out a few tiny round pits from the slippery flesh with a paring knife and you’ll see what I mean. 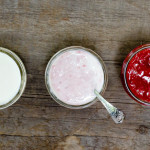 I used mine to pit a few cups of cherries and threw them into the blender with some Greek yogurt, sugar and almond extract, whirred until smooth, and poured the mixture into the molds. It took about ten minutes start to finish and I didn’t have to turn on an oven or a burner. After four hours in the freezer, they were ready to eat. We slurped them outside, without needing baths or a change of clothes. They had the same bright exotic color and full cherry flavor we love, without the pits or mess. Just make sure your kids throw the sticks in the trash, not the sink. If you’re not a fan of cherries, feel free to substitute strawberries, blueberries, or any other ripe summer fruit, using vanilla extract instead of almond extract as you see fit. You may need to adjust the sugar content depending on the ripeness of the fruit. I recommend sticking with full fat Greek yogurt – the low-fat version yields an icier pop and compromises flavor. Also, make sure to prop the molds on a baking sheet before freezing, to catch any drips. 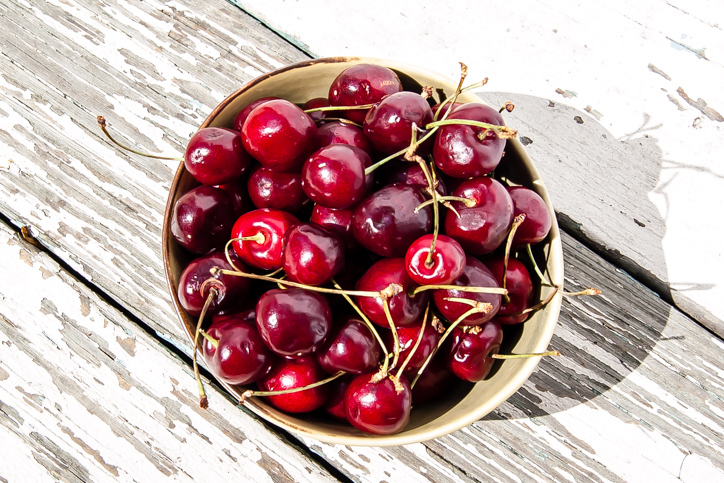 Add the cherries, yogurt, sugar, almond extract and salt to the bowl of a large blender. Blend on the liquefy (or equivalent) setting until smooth. Place the molds on a sheet tray to catch drips, and pour the liquid to the top of each mold. 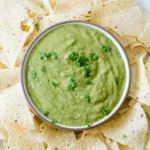 Freeze for 20 to 30 minutes, until the mixture becomes slightly firm. 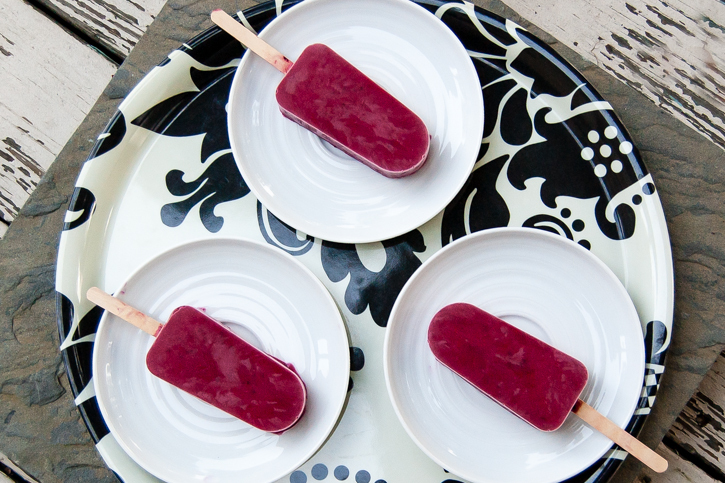 Push one popsicle stick into each mold and return to the freezer, topped with a layer of waxed paper or parchment. Freeze for 4 to 24 hours. Let thaw on the counter for three to five minutes (depending on the temperature of your kitchen). 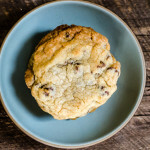 Unmold and serve immediately or store in a freezer-safe bag or airtight container for up to a week. 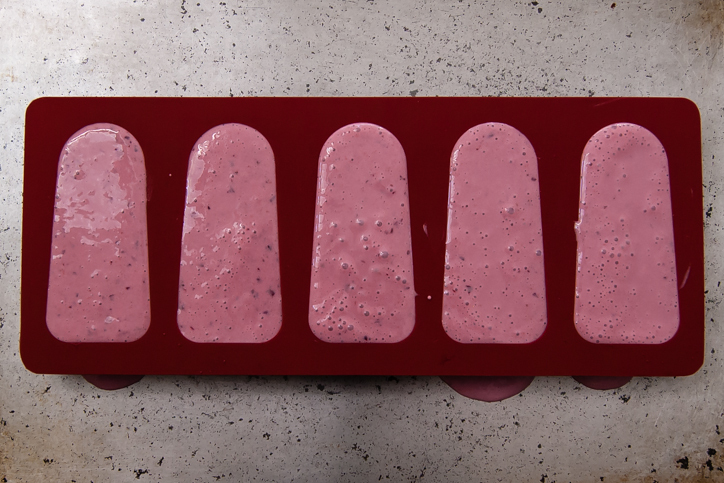 Yields 2 ½ cups of liquid – greater or fewer than 5 popsicles depending on the size of your molds. Love this! Maybe we can make with the bigger kids in OBX? 😉 Site looks amazing.